i don't recall any interviews recently, not that there have been many, where him being or not being an alcoholic has come up...and yeah I suppose in a perfect world we'd all be completely honest with one another no matter what but I'm not so sure that would be a good thing...how many times have we told a girl they looked great in a dress we didn't like? How many times have any of us called in sick when we just wanted to stay home and do nothing? Or when we had a hangover? Come on now...complete honesty is not anything that any of us TRULY expect of one another, so why should we expect it of Edward Van Halen? but like I said, it's really a non-issue because the only interviews I've seen over the past year or so have been gear related in guitar world...and the "press conference" wasn't really a press conference and it didn't come up then either. As far as I can see, he's doing the same thing I'd be doing...not talking about what I don't want to talk about. That's what I meant. RECENTLY he's been avoiding the subject altogether. Which I think is the best way to have it. I was wondering if somebody was going to post this. I saw it right before leaving work last week. I'd never seen a rider so this was interesting to me. Those poor promoters having to find all this crap and set it up just so must be a headache. btw - As mentioned before, Geddy Lee is God. Not a Roth song I DON'T like! Room temp water is actually good for you and has intestinal tract benefits believe it or not. Eastern medicine has been prescribing it for years. Cold water on the other hand, as most prefer it, "constricts the pipes" as it were. And people say that reading this board at work is a waste of company time! HA! Imagine a world without Eddie Van Halen. 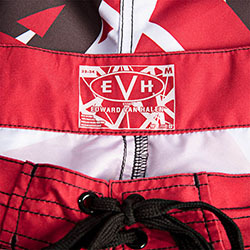 "From the moment David Lee Roth appeared at the top of a giant runway that snaked through the Oklahoma City Ford Center audience Tuesday night, he wore the one thing that told every Van Halen fan that everything was right with the world. It was a maniacal Cheshire cat smile announcing happiness and enthusiasm that cannot be faked. Not only was the old band back together, it was thriving." dave wanting his dressing room as far away from the van halen's as possible is a good thing. Maybe it was the other three that wanted him far away. I wonder if Dave wanted some partying going on in his dressing room and Eddie and Al said "Fine, just keep it away from us and the kid." lol very interesting read. I'd hate to be the persons having to fill those orders. Granoala bars Quaker oats 25% fat free. Fk they don't have ICB or Barqz root beer, who does? lol Thx for posting this. If I were a promoter and VH was coming to my arena for the first time in 24 years (semi-original), I would find the granola bars and root beer for the chubby bass player. I don't have a cool signature. Deal with it! Sam, Dave,Gary... who cares. its all about what makes you feel good. I face mine from the back. PS - I've been drinking. I can't believe Johnny Depp is getting to join the "club." I'd even rather see Dave Grohl in there. They were fun too watch,too. Not when they beating my team of course, but that was a great team.